Recently the waters surrounding Thailand have a new guest, the box jelly fish. Please follow this link to an article I wrote about box jelly fish in 2012 on my Koh Samui info and weather blog. Previously it was thought that the box jelly fish only was around in Australian waters but unfortunately more and more proof shows up that the box jelly fish are on the migration path around various parts of the Asia pacific region. My post is not about creating panic but more to raise the awareness levels of people visiting Thailand and simply to carry a bottle of vinegar when visiting the Thai beaches, since this is your first line of defense. Asia Pacific's Diver Alert Network (aka DAN) John Lippmann, the CEO for the Asia Pacific region has been warning and talking about their presence for at least 5 or more years already and he even had footage of a box jelly fish being filmed around Koh Tao during a "First Aid for Hazardous Marine Life Injuries" presentation he gave in Koh Samui around 5 years ago. If this topic has your interest, it is also a course provided by DAN. During one of my IDC's, back in 2003, an unfortunate incident happened during an the Open Water part of the IDC, off Chaweng Beach when one of my students got stung by a box jelly fish. The student in question was escorted out of the water and brought to a local Chaweng hospital. It wasn't until a few months later, when both the diver in question and myself had a talk with John Lippmann, who was visiting Samui at that occasion for a lecture, that we could come close to an answer of what had stung my student. John asked to see the scars and asked permission to take some pictures for identification by experts. A few weeks later proof came back and the experts confirmed the scars as being caused by box jelly fish. His scars look very similar to the scars on the pictures below. The main reason for writing this specific post however, is a story that happened to a very young boy, aged 4, who was stung by a box jelly fish in Thai waters, Koh Mak, south of Koh Chang in December 2007. His father wrote an article at the Lonely Planet's Thorn Tree forum with a direct link to the article here. I strongly suggest you read the article since it shows how lucky the boy is in actually having survived the attack. He spend 3 days in Trat hospital and while fine now will have permanent scarring over his legs. This is a picture 3 weeks later. The scars shown in the picture will most likely be life long. The article in question has reactions from other participants in the Thorn Tree forum and more articles dealing with the same issue can be found here and here. Other very useful information regarding box jelly fish can be found in this article on Thailandguru. 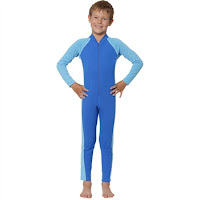 Immediate solutions for protecting yourself are simple and basic, you can wear a full body suit, they come in 1 mm thin versions and always have vinegar with you if you visit a beach. Thanks to Andrew Jones for helping out with this article.